I hope everyone’s first two weeks of 2014 are going great and sailing straight! Around here we are getting back into the swing of things as Nathan starts back school (:(), but we are delighted that this his last! semester in his Master’s degree! We are waiting with fingers and toes crossed to hear from the pdD programs he applied to. Oh. And. We’re getting ready to celebrate my birthday! which is quickly approaching on the 19th. I’m sure next weeks post will have much more about that. 🙂 Does anyone else have a December or January birthday? Does your birthday ever get squashed or ‘combined’ with Christmas? This is seriously a huge pet peeve of mine. Luckily my family is pretty awesome at separating the two. I don’t want to dive too deep into birthday-talk today, though – because I have a yummy recipe to share! Way back almost a month ago now my Mum asked me to make some breakfast foods for Christmas morning. I decided on Cinnamon Rolls and Hashbrown Casserole. 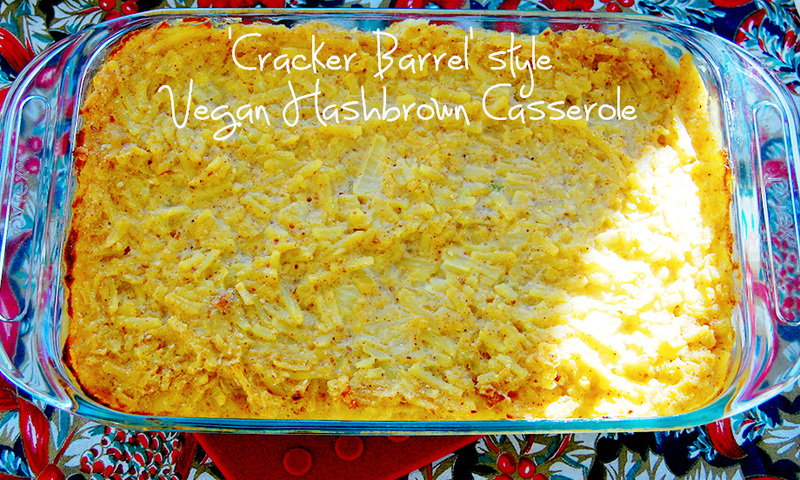 I made a hashbrown casserole of sorts a while back in the crockpot, and it was good, but I was hoping this one would be more of a ‘Cracker Barrel’ style. I had been inspired to make it by a post on 100 Days of Real Food, and if you eat dairy and gluten, her recipe would be excellent to hop over to! The casserole is simple to make, so don’t let the seemingly long(ish) list of ingredients deter you – most of those are used in the cheese sauce. You will also have to forgive me for severely lacking in the picture department on this recipe. There just seemed to be other things distracting me on Christmas morning :). This recipe can most certainly be made ahead of time and refrigerated until you are ready to bake it. Preheat the oven to 350 degrees. Grease a 9x9 or 7x11 casserole dish and set aside. Get hash browns out of the freezer and set on counter to thaw while preparing sauce. In a large pot, sauté the onion in a bit of butter substitute over medium-high heat until it is soft, but not brown (about 1 – 2 minutes). Turn the heat to low and mix in the: gluten free flour blend, almond flour, starch, nutritional yeast, tamari, onion powder, garlic powder, paprika, salt, mustard and milk. Once sauce is thickened, add the hash browns, stirring until they are covered in the sauce. If there are any frozen lumps, break them up as you stir. When ready to serve, bake, uncovered, for 30 – 35 minutes (perhaps longer if you’ve made ahead of time and stored in the fridge), or until it is bubbling throughout. Then turn the oven to broil and broil for 3 minutes, until brown. Watch carefully not to burn. This recipe was included in Ricki Heller’s Weekend Recipe Roundup. Click here to see some other awesome recipes! Can you substitute the almond flour in this recipe? If so, would you need to change the amount? Thanks! You can substitute any other nut flour without changing the amount. I have tried coconut flour and the resulting texture was awful. As far as other flours – I haven’t given them a shot – but I’d love to hear about it if you do! Hi. Can you tell me what to substitute for the 1 cup of Nutritional Yeast Flakes or where I could get them. Just tried making this and it seems like the proportions might be off. I added the non-dairy milk to the flour and spice mix and it formed a paste instead of a thin sauce. I quadruple checked that I had followed the amounts recipe, but it seems that I did! Not sure what happened, but the finished product looks great so I’d love to try it out! The sauce is thin at first, but then turns into a thicker paste like consistency as you start to stir it. As you add the hashbrowns it should cover them nicely. Has anyone tried making this with regular flour? I’m unable to eat regular flour, but it could potentially work. you could certainly substitute any all purpose flour for the gluten free flour blend, but I’m not sure how well the almond flour would translate to regular flour – as it gives the cheese consistency and a nice flavor. I’d love to hear how it turns out if you experiment! This recipe is absolutely delicious! I tweaked it slightly by using half wheat flour and half all purpose flour. I also added Bragg’s aminos instead of tamari and Dijon mustard. Thanks for the recipe! Can this be made ahead of time and frozen? I’d like to pack it for a breakfast while camping. Great question! I have not ever tried this but I would think it would work. Potatoes can sometimes get a bit weird when frozen, but as long as they’re cooked first it should be fine! You could always “test run” with a small batch. I’d love to hear how it turns out!